aDiscrete AM (Acousto-Magnetic) system designed to keep store aesthetics unchanged and undisturbed while keeping merchandise protected. The Floor Loop is fi tted under the flooring materials with essential service components placed in an accessible location. The AM Floor Loop is powered by our robust AM Controller and programmed with our super-sensitive proprietary application, which assures excellent detection of adhesive labels and security tags, all while keeping the selfassured look of a luxury store intact. Remote connectivity and wireless communication are standard features for our NG (Next Generation) line of products ensuring that our systems are easy to install and service at faster response times and with lower costs. Concealed AM (Acousto-Magnetic) system designed to keep store aesthetics unchanged and undisturbed while keeping merchandise protected. 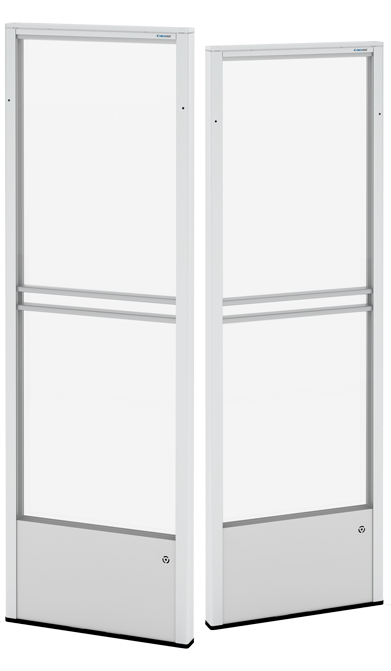 The DOOR LOOP system is an NG (Next Generation) product line that is suitable for protection of standard retail exits in stores that prefer not to have standard pedestals. The door loop is mounted on or inside a compatible door frame, creating a large security field encompassing the exit. Slim receivers are attached on the sides, acting as detectors and alarm indicators. Our powerful AM Controller completes the package, enabling the same great features and performance of our AM pedestal systems while maintaining low signal emissions compared to competing products. A single controller can power two separate door loops, or exits. The AM LOOP system can also be connected to the StoreMonitor cloud or upgraded with wireless communication for easy data collection and maximum security. Discrete AM (Acousto-Magnetic) system designed with a focus on strong detection of adhesive labels, reliability, and flexibility. The AM WINGLETS system is an NG (Next Generation) product line that is suitable for protection of standard retail exits. 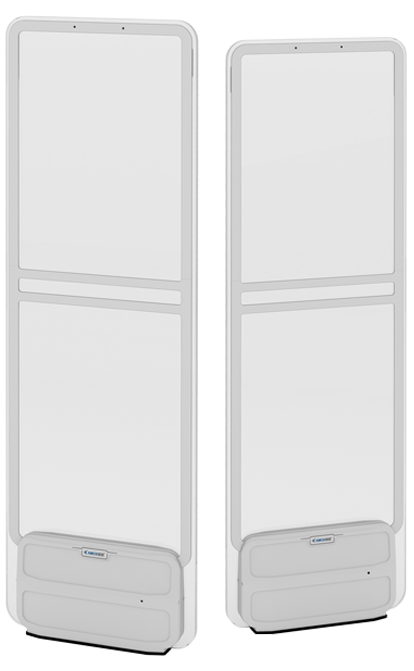 The slim door winglets are mounted on the sides of the entrance or on the door frame for a discrete yet powerful solution that compares to our standard AM pedestals. 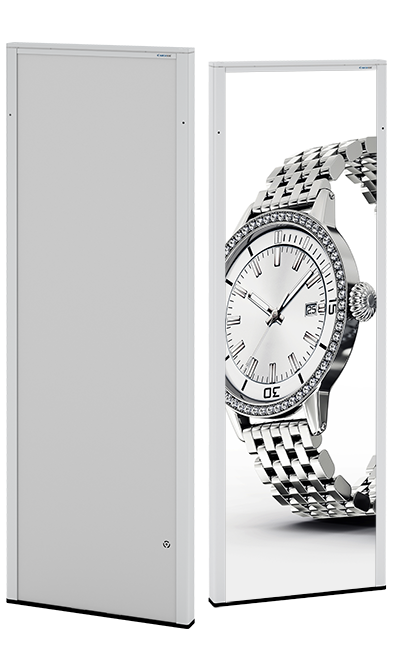 The clear acrylic panel allows it to blend seamlessly into modern or premium retail spaces, with no disruption to the surface of the fl oor. The store retains a more inviting look by having the security system out of direct sight. ull-featured, powerful AM (Acousto-Magnetic) system designed with a focus on strong detection of adhesive labels, reliability, and flexibility. The multi-pedestal AM Controller is an NG (Next Generation) product line that is suitable for any environment, with a performance that ranks at the top of the retail security market. ALUPROFI PLEXI 50 is a wider version of the antenna ALPROFI PLEXI 40. This elegant, transparent antenna, thanks to its increased dimensions, ensures high detection parameters of both clips and anti-theft labels. It is ideal for protecting wide passages. 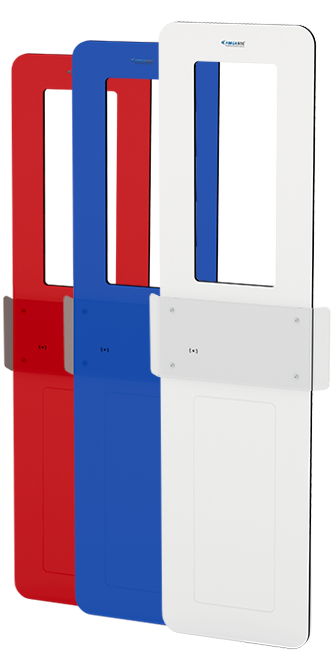 It can be delivered in a version with a customer counter built into the gate. The ALUPROFI PLEXI 50 antenna is equipped with RGB lights that allow you to change the alarm color. - Antenna available in silver, black or white finish! ALUPROFI 50 is a wider version of the ALUPROFI 40 antenna, which enables the integration of the EAS system with our customer counters, MetalSpy metal detectors and / or the MagnetSpy magnet. Everything in one pair of antennas! The entire surface of the antenna can simultaneously serve as an advertising space with dimensions of up to 1456x469mm. The ALUPROFI 50 antenna is ideal for protection of wide transitions, where high detection parameters are required! ALUPROFI PLEXI 40 is an elegant, transparent antenna with a silver, black or white finish. Its modern design will suit any type of interior. This universal antenna enables integration of the EAS anti-theft system with our customer counters. The ALUPROFI PLEXI 40 antenna is equipped with RGB lights that allow you to change the alarm color. The ALUPROFI 40 belongs to one of the most universal antennas, which enables integration of the EAS system with our customer counters, MetalSpy metal detectors and / or the MagnetSpy magnet. Everything in one pair of antennas! In addition, the entire surface of the antenna can be used as an advertising space. This is possible thanks to the easy-to-assemble plexiglass plates for which posters are inserted. The entire exchange takes about 30 seconds and does not require any special tools. Transparent plexiglass boards protect the advertising leaflet from damage. ALUPROFI PLEXI 30 is a transparent, narrow antenna available with a finish in three color options: silver, black or white. Due to its small dimensions, the antenna can be installed in the passages between cash registers, eg in hypermarkets and supermarkets, where the space in the entrance zone is limited. The ALUPROFI PLEXI 30 antenna is equipped with RGB lights that allow you to change the alarm color. ALUPROFI 30 is a simple, narrow antenna available in three colors: silver, black or white. Due to its small dimensions, the antenna can be installed in the passages between cash registers, eg in hypermarkets and supermarkets, where the space in the entrance zone is limited. The ALUPROFI 30 antenna is equipped with RGB lights that allow you to change the alarm color. CRYSTAL EASY 50 is an antenna designed to protect wide transitions, where the detection range of anti-theft labels is up to 240 cm in ideal conditions. Its simple and elegant design makes it suits any type of interior, regardless of what colors and finishing materials were used by the architect in the given premises. The antenna is made of high quality transparent plexiglass, thanks to which it blends in with the surroundings, does not cover the shop interior and does not "disturb" customers. The CRYSTAL EASY 50 antenna enables integration of the EAS anti-theft system with our customer counters. CRYSTAL EASY 40 is an acoustic magnetic antenna made of scratch-resistant and deformed acrylic 2 cm thick (hardened plexiglass). Its simple but aesthetic design makes it suitable for any type of interior, as well as being its complement. The antenna is made of high quality transparent plexiglass - blends in with the surroundings, does not cover the interior of the store and does not "disturb" customers. CRYSTAL EASY 40 enables integration of the EAS anti-theft system with our customer counters. CRYSTAL ULTRA 65 is an acoustic magnetic antenna designed to protect particularly wide transitions in stores using both labels and anti-theft clips. It is an ideal solution for premises with electronics, cosmetics, household appliances, power tools and DIY stores. Its application ensures detection parameters up to 250 cm in ideal conditions. The antenna is made of high quality transparent plexiglass, thanks to which it does not cover the shop interior and does not "disturb" customers.